Gravity water filters are nothing new.. However, as the appetite for quality drinking water filters has become more prominent in recent years, and for good reasons such as the Flint crisis, a need for trustworthy gravity filters has risen. As kitchen and household appliance reviewers, we frequently get questions about gravity water filters, and have decided to share what we have learned through our research in a post to make it easier for you to follow. With this article, we aim to guide you through the basics of gravity filters, how they work, and how to pick the best gravity filters for your needs. What is a gravity water filter? A gravity filter is a filter that takes advantage of gravity to remove contaminants from the water. Typically, it consists of an upper chamber for feed water, a lower chamber where purified water will be contained, and a mediator with filter elements in between. How does a gravity filter work? As the name would suggest, a gravity filter or gravity filtration system operates by exploiting the law of universal gravitation. Following the force of gravity, water will run from the upper chamber to the lower chamber, passing through the filter elements on its way. With millions of microscopic pores, these filter elements trap the impuritants, allowing only water molecules through them. That’s how water is purified in a gravity filter. There are a couple of things you should take into consideration before committing to a filter. While gravity filters tend to have the same design, the filter elements inside, which technically determine the quality of your drinking water, can vary to great extents. Some gravity filters come with simple elements for large sediment removal and taste/odor improvement, while others have more complicated filtration materials to deal with chemicals, heavy metals, and other dangerous water impuritants. On advanced products, the filter elements are usually a combination of several different materials for maximum effectiveness in water purification. With gravity being the only energy it gets, water takes time, typically about 40 minutes for a gallon, to move between the two chambers. That is not too slow if you compare it to the speed of a reverse osmosis filtration system. The problem is that, unlike undersink RO filters which are attached directly into the water line, the gravity filter requires manual filling of the upper chamber, which is not exactly an extracurricular activity of interest to most people. Therefore, if you’re planning to buy one, keep in mind how many people in the household the filter will be serving. Obviously, you don’t want to get an undersized filter and spend your day filling it, nor do you want an oversized one, because first, it’s more expensive, second, it takes more space on the countertop, and third, it’s no eye candy. It’s best to do a rough estimation of your household’s daily needs before buying one. Hint: A person typically needs about half a gallon of drinking water per day, or up to one gallon if they also make coffee, tea, and cook. Any filter element will require replacement after processing a specific amount of water. Replacing the filter is not usually a particularly difficult job, but it involves the disassembly of the whole unit, which is quite a bit of manual work. Therefore, you may want to check the filter capacity thoroughly, calculate how often you will have to replace it based on your household’s water use, and decide if you’ll be okay with the required replacement frequency. Note that some advanced gravity filters may consist of several different elements, which may not have the same capacity and the same lifespan. Two of the most popular chamber materials for gravity filters are plastic and stainless steel. The prefered is naturally stainless steel, which is generally safer for consumption and more durable, but also more expensive. Plastic chambers tend to be more affordable, but less durable. Plus, there are concerns over them leaking harmful chemicals such as BPA into the water. However, it is believed that the risk is very low, especially at room temperature. In case you don’t have the time to spend on checking the specs and digging through hundreds of users’ reviews to find out the right gravity filter for your family, we’ve done the job for you. This section covers a comparison, and a full review of the best gravity filtration systems to purchase this year. Being a time-honored brand of water filters, Berkey doesn’t seem too keen on having an Apple-like timeline for introducing new lines of products. Rather, it only has ever made a few models, each reflecting the considerable effort spent on research and development to make it right. The Big Berkey BK4X2-BB is one of those rare products. It comes with filter elements that significantly reduce the amount of heavy metals, including lead and mercury, along with a plethora of other chemicals such as herbicides, pesticides, and VOCs from your drinking water. In fact, it can even remove food coloring from water, an ability few if any other gravity filters ever claimed to have. You may have noticed from the table that the BK4X2-BB does not have the capability to reduce fluoride. The reason we still singled it out as the best gravity filter to buy is that most of the time, the fluoride level in tap water in the US is safe enough to actually be beneficial, and a fluoride filter would be surplus to the requirements of most healthy people. If you have concerns over the chemical, however, the Big Berkey BK4X2 with fluoride post-filters would better address your requirements. 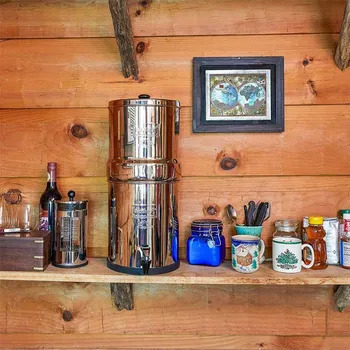 With a holding capacity of 2.1 gallons in a stainless steel shell, this countertop filter is ideal for producing drinking and cooking water for a small family (2 – 4 people). The Big Berkey BK4X2 can be considered an upgrade from the BK4X2-BB, and it’s definitely a gravity filter made for the health snob. It helps that the filter is featured with 2 Black Berkey filter elements with the same capacity as the BK4X2-BB, which means it can remove not only sediments and chemicals, but also pathogenic microorganisms from contaminated water. Each of these elements can process 3,000 gallons of water before retirement. Combined together, they can last up to 6,000 gallons – a capacity not easily found on a gravity filter of its size. What makes the upgrade, and also the reason it skews a bit further on the expensive side compared to other gravity filters, is the two fluoride post-filters installed at the stems of the Black elements. As indicated, they bring the water purity to a higher level by further removing any fluoride in the water that the BB may have failed to catch. These fluoride filters need more frequent replacement, lasting 1000 gallons each, which is shorter than the Blacks but is still worth pinpointing on the longest filter lifespan billboard. It may not be the most popular brand of gravity filters out there, but the Propur Big is in fact one of the few that actually have NSF reports under their belt. It comes certified against NSF/ANSI standards 42 & 53 and NSF/ANSI Protocol P231. Made of ceramic with new ProSorb™ granular activated carbon on the inside, its filter element is designed to remove or reduce heavy metals, pesticides, herbicides, chloramines, and even pharmaceuticals from contaminated water. As a case in point, it filters out 98% of aluminium, and more than 99% of barium, antimony, lead, and arsenic +3 and +5 – a performance most other gravity filters have yet to surpass. Unfortunately, about 80% of calcium also doesn’t make it past the filter. More than 97% of the healthy potassium and magnesium, however, are retained, keeping your water reasonably alkaline. Silver infused, it can prevent the growth of bacteria in the chamber. Unlike the Big Berkey, the element also filters out fluoride, eliminating the need to install additional post-filters. To ice the cake, it has a larger capacity than both of the Big Berkeys introduced: 2.75 gallons, with stainless steel chambers. This US made countertop filter is another very well-rounded product for the money, at least according to most users. The Alexapure Pro filter elements are made with a hybrid ceramic shell and a block core – a combination usually seen on high-end gravity filters. These elements can remove or reduce more than 200 impurities, including lead, chromium, chromium-6, VOCs, and pharmaceuticals. Without any assistance from additional filters, they can help get rid of 97% of fluoride from tap water. You may find it ambiguous, the way the seller claims it can remove “up to 99.99%”, which might be understood as meaning “0 to 99.98%” of the contaminants. Don’t worry just yet, though, as we managed to find a lab test result sheet, which proves the Alexapure Pro does reduce more than 99% of most contaminants. The exception were zinc (82% removal rate) and flouride (hexafluorosilicate , sodium fluoride, and fluorosilicic acid with removal rate of higher than 95%). If all that isn’t impressive enough, it comes with 2 elements, each of which has the ability to process up to 5,000 gallons of water, or more than 3 years for a household of four members. If you fill its spare holes up with additional filters, the whole package can process 20,000 gallons before replacement is needed. That makes it, hands down, the countertop gravity filter with the longest lifespan on the market. The Alexapure Pro has a holding capacity of 2.6 gallons, and can accommodate a household of up to 5 people. If you’re in search of a large countertop filter (8 gallon capacity) with an affordable price, this gravity filter from Zen Water Systems is a good, if not your best option to consider. A ceramic filter with pores as small as 0.2 to 0.5 micron in size, which traps harmful contaminants, parasites, bacteria, and effectively reduce harmful chemicals. For comparison, an e. Coli is about 2.0 μm long and 0.25–1.0 μm in diameter. Silica sand and far-infrared ceramic balls to further remove impurities to increase water alkalinity, and improve bodily functions. Maifan mineral stones to add healthy minerals – calcium, zinc, potassium, manganese, and increase water alkalinity, bringing it the “sweet” taste of natural spring water. A magnetized spigot to reduce any negative effects of the minerals. The unit is not not praised for filter life, compared to the other filters in this collection: the ceramic filter will last 1,000 gallons, while the 5-stage mineral filter lasts only 500 gallons. Given that a person needs up to 1 gallon a day for drinking, making tea and drinks, and cooking, the 2 filters will last a family of four about 8 months and 4 months respectively. At least, with a holding capacity of 8 gallons, you won’t have to fill it up that often.